This Website is for anyone wishing to plan a Tango trip to Buenos Aires. Buenos Aires is a lovely city with friendly people, beautiful architecture, and lively Milongas. The time I spent in Buenos Aires was the most memorable in my life. Buenos Aires is a popular tourist destination among non-Tango dancers but for Tango dancers it is even a more attractive destination. There are Milongas and classes every day of the week and plenty of things to see when you are not dancing. Public transportation is cheap and efficient and it is easy to get around. Learn how to plan your trip by navigating on our table of contents on the left. If you have additional questions send us an email. If you plan on staying for more than a week it is highly adviseable to rent an apartment in an area close to Milongas. 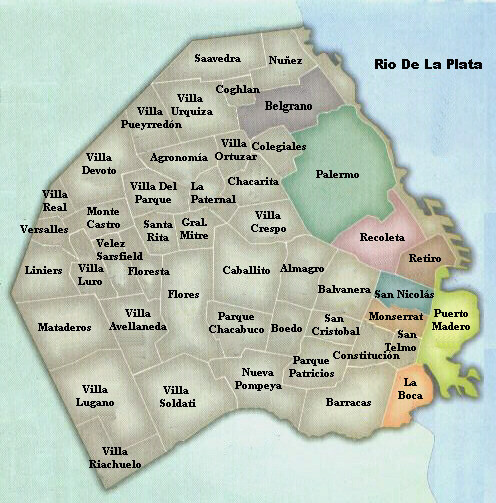 Buenos Aires is broken up into neighborhoods (barrios) and that is the best way to know what area of the city you are in. Palmero is the best neighborhood for Milongas but San Telmo is a good neighborhood also. There is a website: rentangobuenosaires.com that is good about displaying how close milongas are to apartments.